pu-er tea is a winner of teas. in a process that imparts a very special earthy flavor. both of these are Cantonese pronunciations. from a plant that may be related to pre-glacier trees. That Quingmao tea tree, as it is called, is in the family of Camellia or tea plants. It has long ovine-shaped leaves and grows mainly in the highlands in and near Xishanghanna along the Lancanjiang River in the southwestern region of China. introduced this earthy tea to the rest of China. Some say that a Chinese emperor was first to introduce this variety of tea to the west. He sent some to the king of England in 1806. One thing that is guaranteed is that in 1986, Pu-er tea garnered an international award at a fair in Barcelona, Spain. 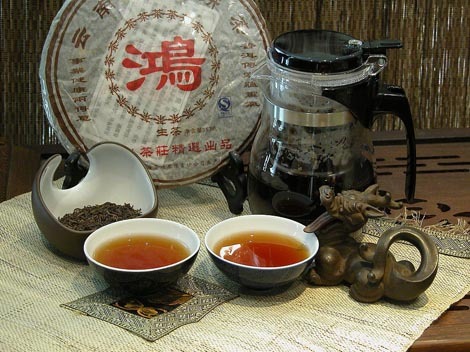 Pu-er tea is considered a mild tea. Those leaves with a light coating of mold are considered the best. Traditional medicine practitioners recommend the tea to relieve indigestion and diarrhea and to reduce cholesterol. These are only some of the medicinal effects attributed to this tea. Popular since Tang Dynasty times (618 - 907 CE), this tea is mistakenly spoken of as a black tea. close to the cusp of what is done for black teas. more than almost all other teas. 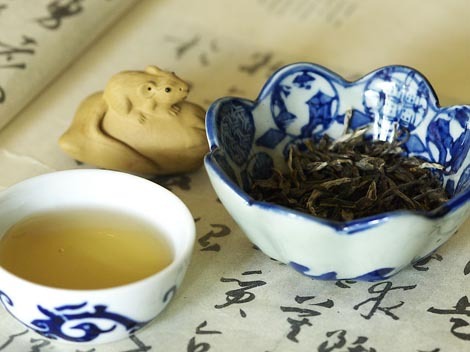 One thing to note about pu-er tea is that it is the only tea the Chinese like to age. respect Westerners give to a fine wine that is well-aged. A third is that this is tea afficionados like to consume this tea in a leisurely fashion and after a extremely good dinner. Should you like to so indulge, buy the very best. Order a pot of pu-er for the table at a good Chinese restaurant. The potof tea has many refills throughout the dinner. You may gulp at the price of the pot of tea, but is only cost about the same price per person as a decent cup of coffee, and lots less than a decent glass of wine. And you will be able to have not one but many cups full. Why does this particular tea so much? 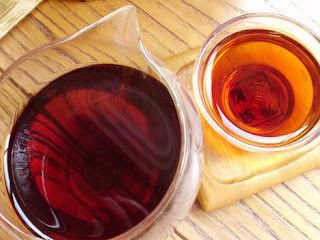 because it is a vintage variety of pu-er that may be about 40 or more years old. Unusual among teas, pu-er teas are fermented (but the technical term is really 'oxidized') as a white tea or green one, or they are semi-oxidized and called an 'oolong' tea. They can also be fully oxidized and be a black tea. Except for the oolong variety, the others are rare and often not very good. The very best leaves are usually prepared as an oolong tea. Emperor Zhong of the Song Dynasty (960 - 1279 CE) learned how great this tea was when he ordered his steamed; he used only the buds with hair on them and said that was the best. Pu-er is versatile in other ways. Some like it mixed with chrysanthemum tea. That is called gupa cha. Made with white tea as the Emperor had it, it is called pu show. Pressed into a bowl shape, as are many other fine teas, it is called tou cha. And as a seven layer cake-tea, it is called bing cha. Made into balls, it is called tuan cha, and in a rectangular cake, it is fang cha. long the tea has been set aside and properly aged. Teabags of pu-er found in a Chinatown supermarket were labeled as two-years old, others said 'five-years-old,' and some had no age. They tasted less good than either of the others. Do not expect the broken leaf teabag types to taste anywhere as good as the longer aged whole leaf varieties; but they are better than some other teas, particularly by the third and fourth infusion. be sure the water is at a rolling boil. Most formosa oolong and black teas need water that high, past when they just start to boil. Green teas brew better at thirty degrees lower than that. use a pu-er tea, aged from two to five years. as in many other food behaviors, do drink aged pu-er tea. About one-quarter of all tea consumed in France is pu-er tea. Mr. Twining, one of England's favorite tea packers, has a fine new pu-er tea. The first tea brought to England in 1712 was a pakho or 'pekoe' tea. the kind loved by the Emperors of China. Today the English also import lots of pu-er tea. of Traditional Medicine have been going through old records. pu-er tea leaves and medicinal herbs were decocted together. Called 'Elixir Tea' and recorded in the Secret Recipes of Pills, Powders, Ointments and Pellets of Chinese Medicine in the Imperial Hospital. A recipe for it appears eight times in the Records of Pulse Conditions of Concubine Ying of Emperor Jiaqing. Medicinals using pu-er tea during Qing court times (1644 - 1911 CE) were mixed with purple leaves of perilla and grass-leaf sweetflags. Also included were the rhizome of water-plantain and Chinese hawthorn slices, among other things. Other items about this tea were touted in Ming times from Tao Hongjing's (456 - 536 CE) annotations about bitter tea. They recommended using it with asparagus shoots and China-greenbriar leaves. Then and now, 'Elixir Tea' is thought useful for the aged. In the Records in Pulse Cases of the Qing Courts, this tea was recommended to cure chills and fevers, headaches and pains from colds, indigestion after a sickness, and nausea. The nobility of the time, who had a liking for and overindulged in greasy and sweet food, believed in drinking pu-er tea. To them, in any of the above mixtures, it was useful in reducing obesity, improving digestion, alleviating depression, and promoting blood circulation. They also liked its taste and its effects on their mood. 'Elixir Tea' can be purchased in upscale Chinese supermarkets and tea emporia. It is still thought to be relieve indigestion and diarrhea and to reduce cholesterol. In China, it has been successfully tested on animals. Do not be fooled, however, should you want to use it to lose weight. Not all teas sold as a diet tea have it or any of the combination of ingredients used in Elixir Tea, nor are there any guarantees it will work. The Chinese classify tea as a cold and bitter food. Its contribution when used for herbal purposes dates back at least to the Han Dynasty (206 BCE to 220 CE). Mixing teas with herbs is thought to have begun with the Southern and Northern Dynasties (420 - 581 CE) and continued to today. Large-scale consumption, that is every day drinking of tea in China started in early Tang Dynasty times (618 - 907 CE). It was the great poet Su Dong Po (1037 - 1101 CE) when writing about the Song Dynasty (960 - 1279 CE) who said that tea drinking was essential for (his own) good health. His living to age sixty-four was cause enough for other Chinese to follow him. They believed and took his words to heart. Jing Xinbo in the Ming Dynasty (1368 - 1644 CE) went further, he wrote about different teas in his book Food and Drink Recipes and said that one should drink it because it aids when needing to cure a disease, and it prolongs life. Have you had your tea this day? Invest as the emperors did and be sure that at least some of the time you drink pu-er tea. The Chinese believe in its many positive effects including its mood-enhancing effects and reduction of melancholy. They confirm that it stimulates digestion and should always be consumed after a large meal. In addition, they drink pu-er tea to help in weight reduction and detoxification as they say it cleanses the body of damaging substances. For those who drink it regularly, the Chinese believe that all tea stimulates their Qi and aids in assuring a long and healthy life.